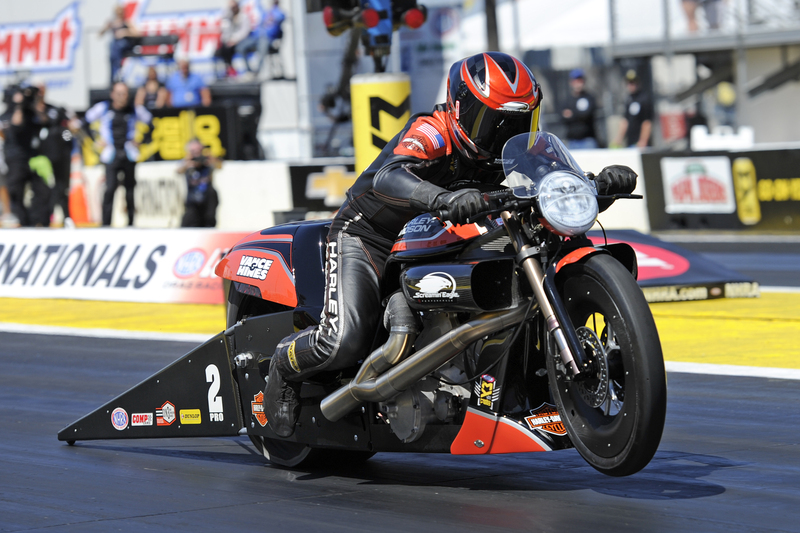 Eddie Krawiec secured his third Pro Stock Motorcycle victory at Summit Motorsports Park with his pass of 6.923 at 195.05 on his Screamin’ Eagle Vance & Hines Harley-Davidson to defeat Jerry Savoie at the Summit Racing Equipment NHRA Nationals at Summit Motorsports Park. Savoie has two final round appearances on the season with a victory at Charlotte earlier in the year. The 2018 NHRA Mello Yello Drag Racing Series season continues at New England Dragway in Epping, N.H. from July 6-8. ROUND ONE — Angie Smith, Buell, 6.932, 192.17 def. Steve Johnson, Suzuki, 6.993, 190.19; LE Tonglet, Suzuki, 6.907, 195.56 def. Mark Paquette, Buell, 6.932, 189.60; Eddie Krawiec, Harley-Davidson, 6.906, 193.85 def. Cory Reed, Buell, 6.959, 192.11; Jerry Savoie, Suzuki, 6.896,194.60 def. Hector Arana, Buell, Foul – Red Light; Angelle Sampey, Buell, 6.903, 193.29 def. Joey Gladstone, Suzuki, 7.066, 189.71; Hector Arana Jr, Buell, 6.866, 195.39 def. Ryan Oehler, Buell, 6.964, 193.71; Jim Underdahl, Suzuki, 6.926, 193.32 def. Matt Smith, 6.899, 195.48; Andrew Hines, Harley-Davidson, 6.953, 192.69 def. Scotty Pollacheck, Suzuki, Foul – Red Light; QUARTERFINALS — A. Smith, 6.972, 191.10 def. Underdahl, 7.080, 188.73; Krawiec, 6.889, 193.46 def. Sampey, 6.922, 193.35; Savoie, 6.916, 193.13 def. Hines, 6.991, 192.25; Tonglet, 6.940, 194.58 def. SEMIFINALS — Savoie, 7.187, 155.10 def. A. Smith, 7.627, 128.07; Krawiec, 6.865, 194.24 def. FINAL — Krawiec, 6.923, 195.05 def. Savoie, 7.071, 175.39. 1. Eddie Krawiec, 515; 2. Andrew Hines, 510; 3. LE Tonglet, 440; 4. Jerry Savoie, 389; 5. Hector Arana Jr, 377; 6. Scotty Pollacheck, 363; 7. Matt Smith, 355; 8. Angie Smith, 272; 9. Angelle Sampey, 257; 10. Hector Arana, 255.